I HAVE been going to Boracay Island since the late 80s, back when it was still basically, an open stretch of pure powdery white sand, with lush coconut trees dotting the shore, and just a smattering of resorts and restaurants. Much of the electricity was still supplied by generators. Going to Boracay was still by land – driving all the way from either Iloilo City, Roxas City, or Antique - if you were not from Aklan. If you managed to find a plane to fly you, you would still usually land at the Kalibo airport, in Aklan, then still make the drive to Caticlan, the jump off point to the gorgeous resort island. From Caticlan, pump boats could take you to Boracay, for a minimal fee. Since regular scheduled air services began in Caticlan in 1996, travelling to Boracay has been faster but not necessarily more convenient for tourists. Tourists arrived in a third-class provincial airport, which was not airconditioned until this year, and where passengers were expected to get their own luggage directly from the airline trolley as there were few porters. On my second trip to Boracay this year, last July 30, I was amazed at the major improvements in the Caticlan airport, courtesy of San Miguel Corp. president, Ramon Ang. The terminal seemed larger, it was now airconditioned, and there was, for joy! a baggage carousel. Not to mention, the restroom was clean and smelled good, thanks to the burning of perfumed oils, and actually reminded me of a hotel washroom. There was also a money-changer on hand to enable foreign travelers to exchange their currencies for our local pesos. At the departure terminal, check-in counters are sleek and brightly lit, everyone is courteous - from the airport security to the terminal fee collectors. It is a two-story affair w/ even VIP lounges for departing guests checked in at Shangri-La Boracay, and Discovery Shores. There are a few food counters where passengers can satiate their hunger pangs and last-minute pasalubong shopping. The most notable feature of the departure terminal, however, is a small private breastfeeding room for nursing mothers and their babies. My, my...will wonders never cease?! The modernization of the Caticlan airport is said to cost $300 million, which includes the improvement of the passenger terminal and the extension of the airport runway. During the summer season, small jets and and most turbo-props of the leading airlines are able to land in the short runway. But when the rainy season comes around, it is usually only the Dornier 328s of Seair, and the Dash 8's of Airphilippines Express which are able to land in the slippery runway. The rest of the planes such as the larger ATRs of Cebu Pacific are either diverted to Kalibo or return to Manila or other points of origin. How true is it though that the newly-improved Caticlan passenger terminal is actually only temporary and a permanent structure will rise in the municipality of Nabas, once the runway extension is completed? According to Boracay resort owners, this was the tradeoff for the Nabas local government to allow the mountain in their midst to be lopped off to give way to the runway extension. 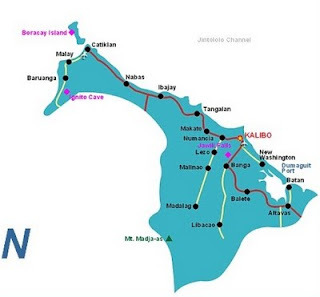 If that is true that will take tourists a longer time to get to Boracay because it is farther than Caticlan, as you can see from the Aklan map below. While having a passenger terminal will definitely boost the living standards in Nabas which is currently a fourth class muicipality, hopefully San Miguel's Ang will reconsider and keep the comfort of Boracay tourists top of mind. This is where we landed, the tiny dock in Tabon, Caticlan, after crossing from the Tampisaan port in Boracay (the severe weather condition as we left the island prevented many from leaving via the usual Cagban jetty port). Tabon is considered an emergency dock where pump boats can park when the waves make it impossible to cross to the main Caticlan port. The bamboo crosspaths, however, are very unstable, and there were a few times I almost lost my footing. This is an accident waiting to happen, and its sturdiness needs to be addressed immediately. *I own the copyright to all the photos published here, except for the Aklan map, which I borrowed from the Makato Community eCenter. By the way, the Tabon port is utilized by the motor bancas / water taxis whenever the waves facing Caticlan Jetty Port is strong. The two-way path structure that connects is still used in this port.